Ah, yes! Track season! Simultaneously the source of great fun and great overwhelm. I’ve already posted my annual plan for the track season. But I thought I’d share my Week 1 microcycle. This is my plan for the first week of practice. Will it go this way? Not likely. But since I know the physiological effect I’m looking to elicit for each session, I can easily come up with a Plan B or Plan C if (when) something doesn’t go right. Keep in mind our first meet is exactly 14 days into the season, not that this fact in any way affects my planning. I anticipate the weather may not cooperate so I may not be able to stay outside all week. I anticipate some kids claiming they are ‘injured’ because the warm up half cripples them because they don’t do any athletic development in their other sports. They just play their other sports. Either way, I am solely responsible for the sprints (55, 300, 4×2, 4×4), hurdles (55HH, 55LH) and jumps (HJ, LJ). Bodyweight Circuit: 40″ on, 20″ off. 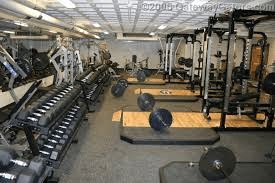 My weight room is a privilege – invite only! 2. What I use to train my hurdlers: Tony Veney’s ‘Advanced Sprint Hurdles Development. That’s my plan for Week 1. Feel free to to ask questions or make suggestions!